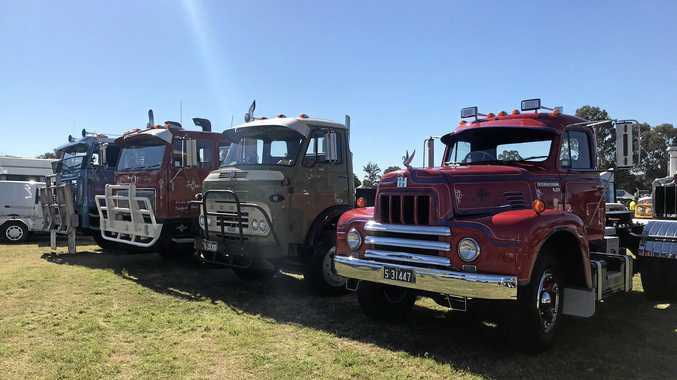 AFTER a weekend of running around ensuring everything went smoothly at the Heritage Truck Association annual show, the deluge of positive messages club president Trevor Davies received made his day. "All the elders from the industry rang and left messages for me on Monday,” Trevor said. Trevor said the show, held at the Rocklea Showgrounds in Brisbane on May 19-20, was successful and he was "really happy” with the weekend. "On the Saturday, we couldn't have got another truck through the gates,” he said. Trevor said the show featured veteran, vintage and heritage trucks, as well as vintage tractors and cars. "We had a great display that included some really rare trucks,” he said. The highlight of those rare trucks, he said, was a Cherry Picker Mack and a Thornycroft Trident, which they suspected was one of three in the whole world. Trevor, who has been president of the club for eight years, said he enjoyed seeing the friendships formed between members and wanted to make sure history was preserved for future generations. Trevor paid tribute to the show's major sponsors, Brisbane Isuzu and Brown and Hurley, for their support.